From the author of the New York Times bestseller The Plant Paradox comes a groundbreaking plan for living a long, healthy, happy life.From the moment we are born, our cells begin to age. But aging does not have to mean decline. World-renowned surgeon Dr. Steven Gundry has been tr... read full description below. From the author of the New York Times bestseller The Plant Paradox comes a groundbreaking plan for living a long, healthy, happy life.From the moment we are born, our cells begin to age. But aging does not have to mean decline. World-renowned surgeon Dr. Steven Gundry has been treating mature patients for most of his career. He knows that everyone thinks they want to live forever, until they hit middle age and witness the suffering of their parents and even their peers. So how do we solve the paradox of wanting to live to a ripe old age-but enjoy the benefits of youthThis groundbreaking book holds the answer. Working with thousands of patients, Dr. Gundry has discovered that the diseases of aging we most fear are not simply a function of age; rather, they are a byproduct of the way we have lived over the decades. In The Longevity Paradox, he maps out a new approach to aging well-one that is based on supporting the health of the oldest parts of us: the microorganisms that live within our bodies.Our gut bugs-the bacteria that make up the microbiome-largely determine our health over the years. From diseases like cancer and Alzheimer's to common ailments like arthritis to our weight and the appearance of our skin, these bugs are in the driver's seat, controlling our quality of life as we age.The good news is, it's never too late to support these microbes and give them what they need to help them-and you-thrive. 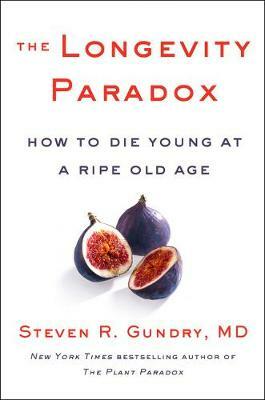 In The Longevity Paradox, Dr. Gundry outlines a nutrition and lifestyle plan to support gut health and live well for decades to come. A progressive take on the new science of aging, The Longevity Paradox offers an action plan to prevent and reverse disease as well as simple hacks to help anyone look and feel younger and more vital. The Longevity Paradox offers a fresh perspective on an existential question: how can we live a long life and grow old while still enjoying the physical and mental qualities of being young? What Dr. Gundry shows us is not only that it's possible to thrive as we age, but that the power to do it lies in our own hands (or, more accurately, our guts). It's an essential read for anybody who's growing older - which is to say, everybody. --Arianna Huffington, Founder & CEO, Thrive In The Longevity Paradox, Dr. Steven Gundry upends many long-held beliefs about aging, debunking common misconceptions and making the provocative yet persuasive argument that the length and quality of our lives is a function of the health of our microbiome. Practical, informative, and hopeful, this book will change the way you think about aging. --Mark Hyman, MD, Director, Cleveland Clinic Center for Functional Medicine and #1 New York Times best-selling author of Food: What the Heck Should I Eat?